Boom! 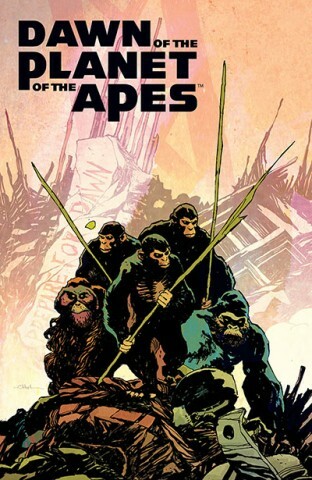 Studios, which have had several Planet of the Apes tie-in titles over the years, now turn their sights toward this summer’s hit movie — with a new full-color comic book miniseries titled, appropriately enough, Dawn of the Planet of the Apes. “Bridging the 10-year gap between the Rise of the Planet of the Apes and Dawn of the Planet of the Apes films, fans will bear witness to the fall of humanity and the rise of Caesar’s civilization. While the apes of the world have yet to advance as a species, Caesar must find a way to unify in them to one cause. On the other side of the country, Malcolm must venture into the decaying Americas with his family to find a cure for the plague slowly killing his wife, Rita. World powers will shift as civilizations collapse and rise.” Written by Michael Moreci (Curse, Hoax Hunters) and illustrated by Dan McDaid (Mind the Gap), issue #1 of the the new Dawn is available now.